We've identified 86 Rev War soldiers buried in Fishkill. Town of Fishkill Planning Board Meeting - Final decision on the Continental Commoms development plan begins at 7:00pm. As with the meeting in March, we will be wearing our white-colored “Stop Continental Commons” t-shirts. Please bring yours or pick one up in the lobby as you enter the meeting room. Let’s be there in full force! The election results are in for the 2019 version of the FOFSD board of trustees. Congratulations are in order for Secretary Tim Middlebrook & Trustees John Groen, Rob Ashworth and Kevin Hathorn. In addition, newcomer Rob Leonard was voted in to replace Frank Giusto who served the board for 4 years. Thank you for your service, Frank! All five candidates will serve a two year term and were elected by a total of 22 votes each. Special thanks to those who took the time to vote. In addition to those listed above, Treasurer Ann Shershin, Rob Buccheri, Keith Reilly and President Lance Ashworth represent the remaining board members. 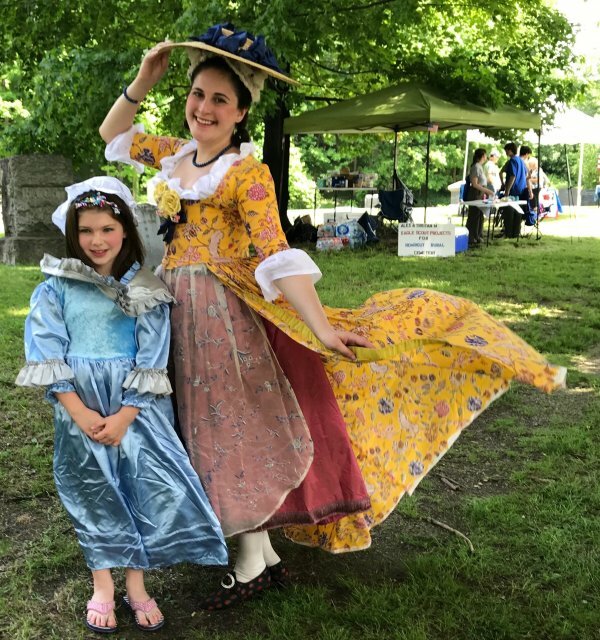 This years winning photograph was taken on Saturday, May 26, 2018, during the Second Annual Heroes of Fishkill Day commemorating the town's Revolutionary War patriots and honoring the 57 Fishkill Women of the Revolution buried at the Rombout Rural Cemetery in Fishkill. Inspirational opening remarks were offered by Robert LaColla, Town of Fishkill Supervisor, Helen Walker, Regent, Melizingah Chapter National Society of the Daughters of the American Revolution, Tim Middlebrook,President, Columbia Mid-Hudson Valley Chapter of the Sons of the American Revolution and Lance Ashworth, President, Friends of Fishkill Supply Depot. The gathering, with an estimated 75 attendees, featured presentations on Revolutionary War medicine, the Colonial families of Fishkill, and LaFayette's travel through Fishkill in May 1780, a talk given by Dr. Robert A. Selig, Historian-Consultant to the Washington-Rochambeau Revolutionary Route National Historic Trail. Participants walked among the final resting places of Continental Army soldiers thanks to markers emplaced by the Columbia Mid-Hudson Valley Chapter of the Sons of the American Revolution. Also participating were the Boy Scouts of America, the 5th NY Regimental and the “Hearts of Oak” period re-enactors. The event was hosted by the Cemetery Association, Friends of Griffin's Tavern, and Friends of the Fishkill Supply Depot. Visit: www.facebook.com/FOFSD/ to see more awesome photos of the HOF event! 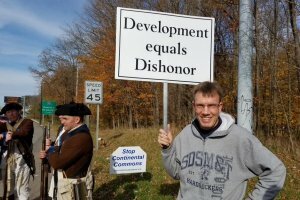 In an effort to show community support for the opposition to Continental Commons development plan, we have initiated an on-line petition to be sent to Town of Fishkill officials. Please join the thousands of people who have signed the petition and share it with family & friends by right-clicking and copying the link, then posting it your favorite social media application. 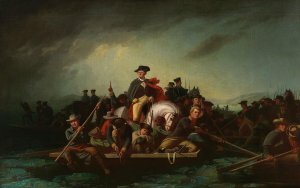 Late on Christmas night, Washington crossed the Delaware River with his rag-tag army of 2,400 men and slipped into the streets of Trenton. After a long day of Christmas revelry, the Hessian mercenaries were no match for the shivering Americans. More than 900 of them were captured, shot or escaped. The Revolutionary War would not end for five more years, but the Battle of Trenton was a big turning point. Had it not bee for the cover of the snowstorm, the battle might have gone the other way. Huzzh! 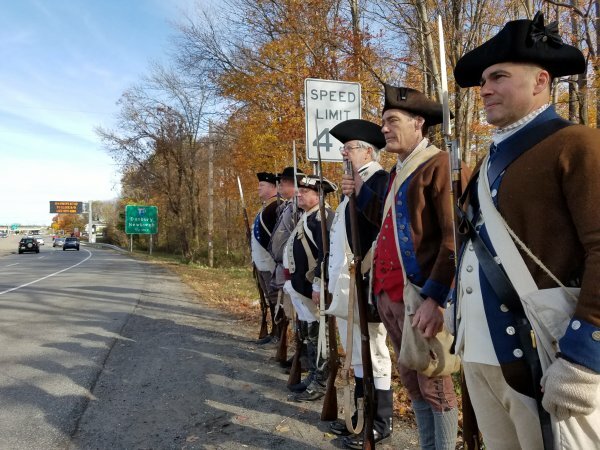 On Saturday, November 4, 2017, Revolutionary War re-enactors from the 5th New York and other regiments ceremonially guarded the Fishkill Supply Depot. The symbolic "Guarding of the Supply Depot" comes at a time when the Continental Commons development plan threatens to destroy the many cultural resources at the site, including the foundation of a soldiers' barracks building first identified by archaeologists operating under the direction of Temple University in the early 1970s. Historical records indicate that on the exact same date 240 years ago (in 1777) the Fishkill Supply Depot was under threat of attack by local Tories and its security posture was heightened to meet the enemy. On October 14, at 8:00pm FOFSD members gathered at the D.A.R. 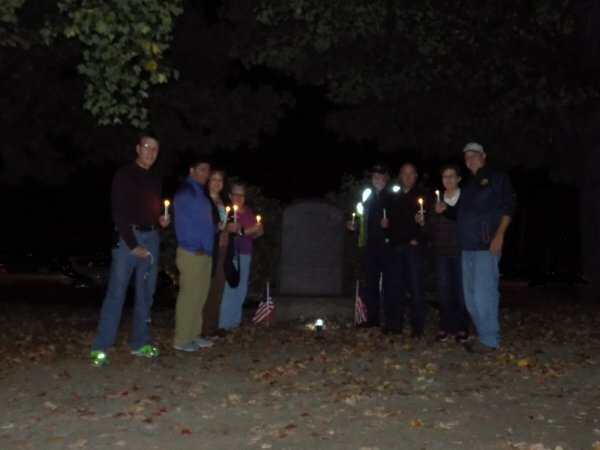 monument for an impromptu candlelight vigil honoring the soldiers buried in Fishkill. The ceremony included a recital of the 'Battle Hymn of the Republic' and shared their thoughts on protecting this sacred ground. Photo taken at our second board meeting of the year on Sunday, April 23, 2017. Pictured here: L-R Front row - Trustee Rob Buccheri, President Lance Ashworth & Treasurer Ann Shershin. Back row - Secretary Tim Middlebrook, Volunteers Penny Steyer, Bill Sandy and John Groen. Whether you have visited our site before or if it's your first time, you may be wondering, "Why Fishkill residents should oppose Continental Commons?" Written below is our official position and why we believe you should oppose further commercial expansion on the historic Fishkill Supply Depot site. Continental Commons is a plan submitted to the Town of Fishkill by the Pelham, NY-based entity GLD3, LLC on July 11, 2015, which calls for the commercial development of a 10.47 acres wooded lot located on the east side of U.S. Route 9, south of the Speedway station (formerly Hess), north of the Maya Café, and across from the Dutchess Mall area. The developer acknowledges the 10.4 acre lot as a Revolutionary War site but intends to only preserve .25 acres where a Continental Army cemetery containing multiple bodies is located. Proposed for the site are an iHop restaurant, small hotel, boutique shops, and a petting zoo with live animals, the creation of which will require the destruction of over 95% of the historic site. Why should I oppose this development plan? 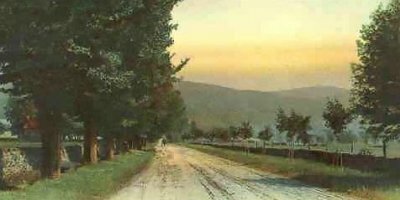 The wooded lot is located at the very center of a Revolutionary War site known as the Fishkill Supply Depot that was placed on the National Register of Historic Places in January 1974. Archeological studies conducted over the past decades have shown that the wooded lot contains building foundations, countless artifacts, and various other ruins associated with the Continental Army’s occupation at Fishkill. Due to its wartime supply and logistical mission, the site’s archeological features are unique among the already preserved Revolutionary War sites. Archeological studies also identified a long-lost soldiers’ cemetery where an estimated 320 soldiers lie in unmarked graves. Independent research has identified 83 Americans, 2 Canadians, and a French soldier believed to be buried at the same spot. Commercial development will destroy unique ruins, dishonor the memory of the heroes who served (and are buried) at the site, and permanently scar the historic landscape of Fishkill. What will happen if development is stopped? 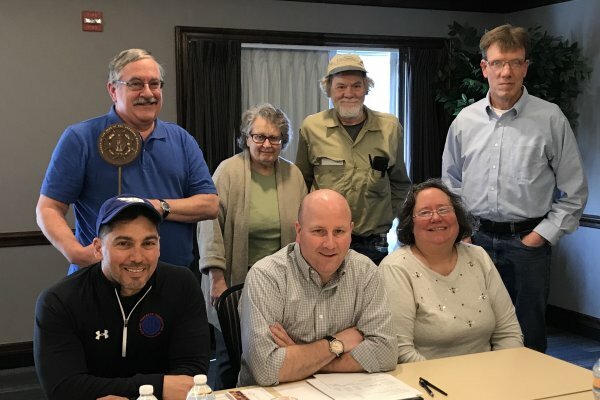 Our group will continue to seek community engagement and partnership to secure funding, acquire the wooded lot, and preserve the site for future archeological and historic study in a format similar to the Jamestown Project in Virginia. We will also seek to acquire, study, and interpret other lots within Fishkill Supply Depot’s historic footprint so that, over time, a single historic site is created and joined to the Hudson Highlands State Park Preserve. Contact the Town of Fishkill Planning Board (807 Route 52, Fishkill, NY 12524) and voice opposition to Continental Commons. Serve as an active volunteer with our group on projects relating to education and outreach. Most importantly, donate to our Preservation Fund that was established for the acquisition of the Fishkill Suppy Depot and other related historic properties. Enjoy this special poem written about the soldiers' burial ground and the legacy of the historic Fishkill Supply Depot.